Phil Lowe in front of the Lie-Nielsen tool display. 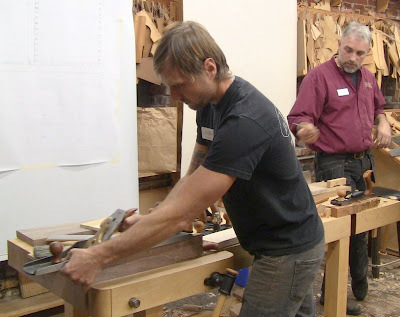 This past Friday and Saturday I again participated in the Lie-Nielsen Hand Tool Event at Phil Lowe's Furniture Institute of Massachusetts, representing the Society of American Period Furniture Makers. Like last year, this was a great opportunity to see some great woodworkers at work and tell people about SAPFM membership. 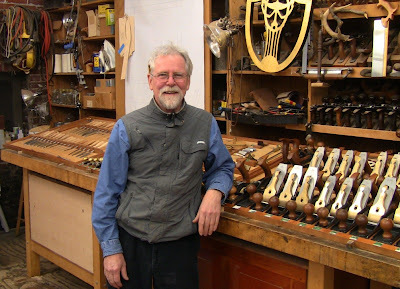 Phil is one of my woodworking heroes. While I've never taken any of his classes, I've learned a tremendous amount over the years from his articles and videos. 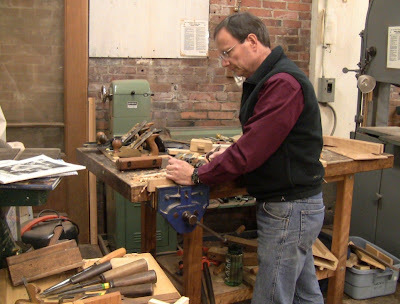 Formerly head of the cabinetmaking and furniture program at North Bennet St. School, he's superbly skilled and enjoys passing the craft on to others. 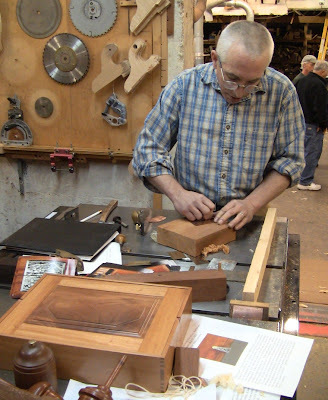 Peter Follansbee carving details in a chest stile. Peter Follansbee was busy working on a full-sized chest of drawers made of riven oak. You can read more about this chest on his blog. I had him autograph my copy of his new book co-authored with Jennie Alexander, Make a Joint Stool From a Tree. Tico Vogt, left, talking to SAPFM member Bruce Wedlock. Tico Vogt was promoting his Super Chute 2.0 shooting board, demonstrating how precisely he could fit a piece to an opening. Matt Bickford, rear, talking to blog reader Albert Oullette. Matt Bickford was demonstrating his gorgeous wooden moulding planes and selling copies of his new book, Mouldings in Practice. One of the new people I met was John Cameron, an instructor at FIM. I had seen some of his work on display at Topsfield Fair. In addition to woodworking, he also teaches metal engraving. His engravings are beautiful, amazingly detailed small pictures of line art, lettering, stippling, and deep chisel carving. He uses these for custom furniture hardware and decorations. John Cameron engraving a small metal plate. 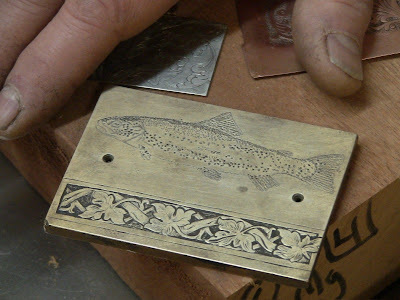 I loved John's gorgeous stippled trout. 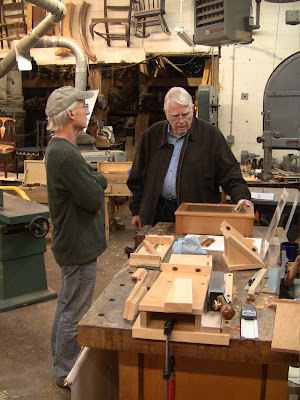 Another new woodworker I met was Roger Benton, working as LN event staff. In addition to making custom furniture, he runs a lumber mill that uses only fallen wood from the New York City area. This is the true essence of Harvesting Urban Timber . 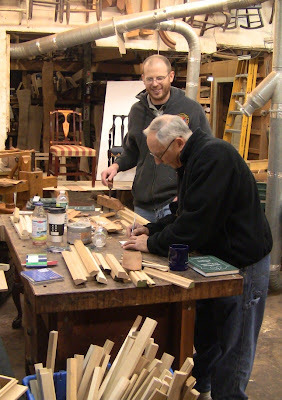 LN event staff Roger Benton, left, and Deneb Puchalski demonstrating hand plane use. Since a couple of people had to cancel for the event, I had extra space, so I made like the Three Stooges and spread out. I brought my portable workbench to use as an auxiliary tool and display space. I set up my always-popular portable sharpening station and SAPFM brochures on it, along with a variety of tools I was using. That helped keep the main workbench from getting completely overwhelmed with stuff. 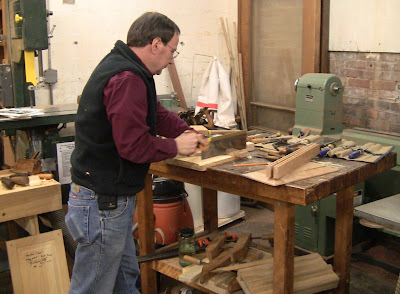 When not talking to people, I continued working on the cherry frame and panel door I had started at the previous Hand Tool Event at Connecticut Valley School of Woodworking. One thing I've started doing is orienting the workbench so that I'm working on the same side as people coming by. That way I can offer the tools to them to let them try. If they're afraid of ruining my work, I have plenty of scraps for them to use. I gave several impromptu demonstrations of chisel sharpening, saw sharpening, and panel raising. 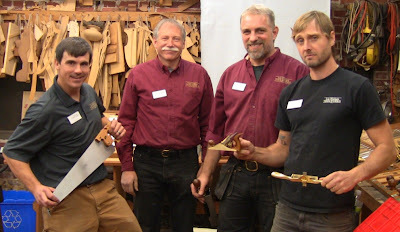 Modern Woodworkers Association Boston chapter members Nick Roulleau and Keith Peterson also stopped by to visit. Using my recently-acquired Stanley 48 tongue and groove plane to groove a door rail. Photo by Nick Roulleau. Sawing a tenon shoulder. Photo by Nick Roulleau. 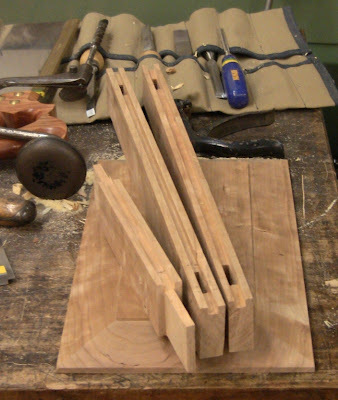 My progress for the event: mortise and tenons and grooves cut into 1 rail and 2 stiles. LN show staff, left to right, Tim Lovett, Ted Dishner, Deneb Puchalski, and Roger Benton. Ted asked how the event had gone for me, and I told him I judge my success by how little I get done on my project. Small progress means I spent a lot of time talking to people, showing them things and letting them try the tools out. So this was definitely a success! As usual, very nice coverage, Steve. Thanks for profiling Roger and the others on the L-N event staff. I've been lucky to be a guest at a number of shows this year and gotten to know staff members. They are a great group. A great write up of a very memorable event. 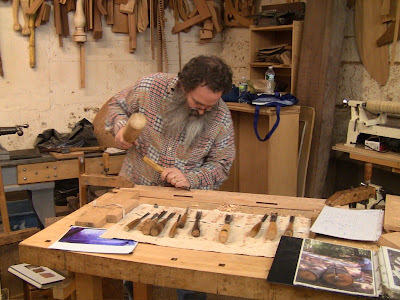 Any chance you will be at the Brooklyn, NY Lie Nielsen Hand Tool Event next weekend? Thanks, Roger! Unfortunately, no I won't be in Brooklyn. I mostly stick to the New England area.